Coleman, Patricia H. and Erin James-abra. "Clara Benson". The Canadian Encyclopedia, 15 January 2018, Historica Canada. https://www.thecanadianencyclopedia.ca/en/article/clara-cynthia-benson. Accessed 18 April 2019. Clara Cynthia Benson, professor of chemistry (born in 1875 in Port Hope, ON; died 24 March 1964 in Port Hope). In 1899, Benson became the first woman to graduate in chemistry from the University of Toronto. In 1903, she became one of the first two women awarded a PhD at U of T. After graduating with her doctorate, she worked at U of T’s Lillian Massey School of Domestic Science, becoming one of the university’s first female professors in 1920. A capable teacher who stimulated research and was a friend to her students, Benson taught at the school until her retirement in 1945. The Benson Building at U of T was named in recognition of her efforts to obtain better athletic facilities for women students. Clara Benson’s parents were Thomas Moore Benson, a businessman, lawyer and judge, and Laura Abigail Fuller. They had three children, including Clara, as well as two girls from Thomas’s first marriage (his first wife passed away). 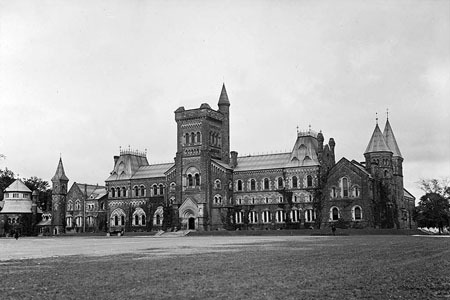 Benson began her post-secondary studies in 1885 at University College at the University of Toronto (just one year after the university began admitting female students). She majored in math, chemistry and physics, subjects considered unusual for women, and at a time when female students had no access to reading rooms or library catalogues (see also Women and Education). Despite these challenges, in 1899, Benson became the first woman to graduate with a Bachelor of Arts in chemistry from U of T.
University College, University of Toronto, circa 1917. Benson immediately went on to pursue her PhD, a degree U of T introduced in 1897. In 1903, she graduated with her doctorate in chemistry. The title of her doctoral thesis was The Rates of the Reactions in Solutions Containing Ferrous Sulphate, Potassium Iodide, and Chromic Acid. Benson, alongside Emma Baker (philosophy), were the first women to earn a PhD from the university. Following the completion of her PhD, Benson took a job as a food science demonstrator at U of T’s Lillian Massey School of Domestic Science (see Home Economics). While she didn’t agree with the notion of a program aimed at preparing women to be housewives, there were few other job opportunities available to her. She was quickly promoted to lecturer, and in 1906 to associate professor. During the First World War, Benson discovered that the chemical properties of food and explosives could be analyzed using the same process and her methodologies were quickly adopted by munitions laboratories. In 1920, Benson and the school’s principal, Annie Laird, became U of T’s first female professors. Benson retired in 1945. Today, the Canadian Society for Chemistry presents the annual Clara Benson Award to a woman whose work in Canada has made a distinguished contribution to the field.